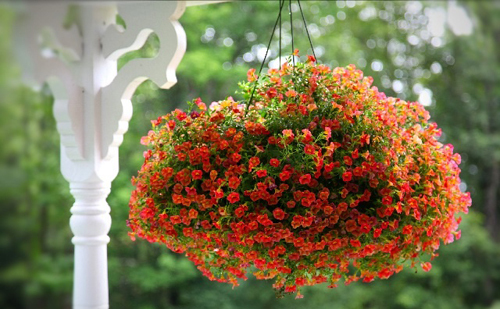 If you are into pansies and geraniums, then here is your guide to creating your very own stunning hanging flowerpots. Hanging flowerpots can be found in plastic, clay pots, wicker, or moss. Finding them is a bit harder than you would think. Many people will find themselves having to create their own. This is not hard to do. Obviously, the plants you choose to grow will dictate the size of planter you will need. A larger planter leads to higher water retention and bigger more vibrant plants. We recommend you use a pot liner of moss, supamoss or burlap liner which helps to retail water so it doesn't run off. Fill with potting soil making sure you have 5 inches above the base of the planter. Then add your plants just below the soil line. Pansies are a favorite. They are slightly acidic and like well draining soil. Another favorite is trailing lobelia which will hang out the sides. They are less hardy but still durable. Come winter time, it's time to clean out the planter and put them away till next Spring.